What do you do if you fail as a storekeeper and farmer? Become a lawyer! That's what Patrick Henry did. By the time he became a member of the First Continental Congress, Henry was known as a great orator. Americans were fed up. The "Intolerable Acts" were more than the colonies could stand. There was agreement that this new quandary warranted another intercolonial meeting. It was nearly ten years since the Stamp Act Congress had assembled. It was time once again for intercolonial action. Thus, on September 1774, the First Continental Congress was convened in Philadelphia. Quartering Act (March 24, 1765): This bill required that Colonial Authorities to furnish barracks and supplies to British troops. In 1766, it was expanded to public houses and unoccupied buildings. Boston Port Bill (June 1, 1774): This bill closed the port of Boston to all colonists until the damages from the Boston Tea Party were paid for. Administration of Justice Act (May 20, 1774): This bill stated that British Officials could not be tried in provincial courts for capital crimes. They would be extradited back to Britain and tried there. Massachusetts Government Act (May 20, 1774): This bill annulled the Charter of the Colonies, giving the British Governor complete control of the town meetings. Quebec Act (May 20, 1774): This bill extended the Canadian borders to cut off the western colonies of Connecticut, Massachusetts, and Virginia. 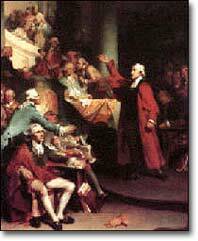 Colonists came together at the First Continental Congress to protest the Intolerable Acts. This time participation was better. Only Georgia withheld a delegation. The representatives from each colony were often selected by almost arbitrary means, as the election of such representatives was illegal. Still, the natural leaders of the colonies managed to be selected. Sam and John Adams from Massachusetts were present, as was John Dickinson from Pennsylvania. Virginia selected Richard Henry Lee, George Washington, and Patrick Henry. It took seven weeks for the country's future heroes to agree on a course of action. First and most obvious, complete nonimportation was resumed. The Congress set up an organization called the Association to ensure compliance in the colonies. A declaration of colonial rights was drafted and sent to London. Much of the debate revolved around defining the colonies' relationship with mother England. A plan introduced by Joseph Galloway of Pennsylvania proposed an imperial union with Britain. Under this program, all acts of Parliament would have to be approved by an American assembly to take effect. Such an arrangement, if accepted by London, might have postponed revolution. But the delegations voted against it — by one vote. One decision by the Congress often overlooked in importance is its decision to reconvene in May 1775 if their grievances were not addressed. This is a major step in creating an ongoing intercolonial decision making body, unprecedented in colonial history. When Parliament chose to ignore the Congress, they did indeed reconvene that next May, but by this time boycotts were no longer a major issue. Unfortunately, the Second Continental Congress would be grappling with choices caused by the spilling of blood at Lexington and Concord the previous month. It was at Carpenters' Hall that America came together politically for the first time on a national level and where the seeds of participatory democracy were sown. Handy-dandy list containing all of Delaware's Delegates to the Continental Congresses with the years they served. There are thin bios on some of the more important reps including Caesar Rodney and John Dickinson. From the Library of Congress, the Journals of the First Continental Congress. These journals were kept by the Secretary of the Congress, Charles Thompson, who was known as the "Sam Adams" of Philadelphia. The Journals were edited by historians at the Library of Congress in 1904 which makes understanding the motivations of the delegates much clearer. In response to the Intolerable Acts, the Boston Committee of Correspondence sent a circular letter throughout the colonies urging a stoppage of trade with Britain. Business-minded New Yorkers felt sympathetic toward their distressed "sister" colony, but implied that only a continental congress could suitably handle the matter. This short primary source document reveals how and why New York decided to send delegates to a Continental Congress. Peyton Randolph of Virginia was the President of the First Continental Congress. This page contains an introductory-length bio about him from the people at Williamsburg. 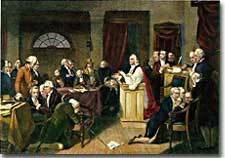 It was at the First Continental Congress that America came together politically and spiritually for the first time. At Philadelphia's Carpenters' Hall they decided that each Colony would rule itself. Read the resolves that they sent to King George and Parliament. 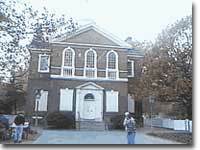 Robert Smith was the master builder who oversaw the construction of Philadelphia's Carpenters' Hall. Read a mini-biography and get a small glimpse into the life of an 18th-century builder. Not only was Roger Sherman a delegate to the First Continental Congress, but he was the only Revolutionary to attend the Albany Conference of 1754, the 1st and 2nd Continental Congresses and the Constitutional Convention as well. Intolerable. Coercive. Unfair. To the colonists, the Intolerable Acts were the last straw. Retribution. Punishment. Justice. To Britain, they were payback for the Boston Tea Party and colonists who had gotten out of line. 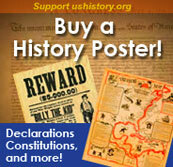 Read the text of the Intolerable Acts at USHistory.org. As yellow fever ravished Philadelphia, nefarious robbers were hard at work conducting America's first major bank robbery — a heist at Carpenters' Hall. And it was an inside job. The alarming measures of the British Parliament relative to your ancient and respectable town, which has so long been the seat of freedom, fill the inhabitants of this city with inexpressible concern. Read how New Yorkers decided to send delegates to the First Continental Congress.